Be sure not to miss any of our Special Offers! Sign up for our mailing list to receive our Special Weekly Deals! We are pleased to offer all of our loyal customers these special programs and discounts to help in your scientific research needs. EMS Pipette Pro Pack - For a limited time, buy the EMS Pipette Pro Pack at 40% off and receive a Carousel Stand for free! The EMS Pipette Pro Pack consists of 3 models of pipettors that serve the most commonly used volume ranges in the laboratory: 2µL - 20µL, 20µL - 200µL, and 100µL - 1000µL. When used in conjunction, the pipettes in this kit cover a combined volume range of 2µL - 1000µL. These light-weight ergonomic pipettes offer exceptional accuracy and reproducability, as well as reduced actuation forces for increased user comfort. These state-of-the-art pipettes normally retail for $215 each. But, order the Pipette Pro Pack now and receive a 40% discount! And that's not all... Place your order by Match 31st and receive a Universal Pipette Carousel absolutely FREE of charge! That's 3 high precision pipettes and a universal carousel stand for the extraordinary price of $387.00! Other pipette sizes available at the same special prices. EMS Grids - For a limited time, buy 10 EMS Grid vials, get 3 EMS Grid vials of equal or lesser value free! Visio-tek™ Digital Wi-Fi/USB Microscopes - Order a new Visio-tek™ Digital Wi-Fi/USB Microscopes and receive 10% off. Visio-tek is a line of versatile, portable digital microscopes with Wi-Fi transmission. Every device can be connected to iOS and Android smartphones or tablets through a specific Visio-tek App or through a Wi-Fi/USB connection to computers and laptops (Windows or Mac). They break the conception of traditional microscopes to realize the following functions: measurement, conservation, copy and transfer of images and video, which are difficult for a traditional microscope. They are small, easy to operate, light, and portable. They can be used with all the most popular smartphones, tablets and even with PCs. MeX - 3D Measurement for the Scanning Electron Microscope - Order new MeX software and receive 30% off. MeX is a stand alone software package that turns any scanning electron microscope (SEM) with digital imaging into a true surface metrology device. Using stereoscopic images the software automatically retrieves 3D information and presents a highly accurate, robust and dense 3D dataset which is then used to perform traceable metrology examination. The results are obtained irrespective of the SEM magnification providing metrology at macro and micro levels. PP3010T Cryo-SEM Preparation System - Order a PP3010T and receive a $2500 credit towards the purchase of any of our EMS line of products. The PP3010T is a highly automated, easy to use, column-mounted, gas-cooled cryo preparation system suitable for most makes and models of SEM, FE-SEM and FIB/SEM. The PP3010T has all the capabilities to rapidly freeze, process and transfer specimens. The cryo preparation chamber is turbomolecular pumped and includes tools for cold fracturing, controlled sublimation and specimen coating. The specimen can then be transferred onto a highly stable SEM cold stage for observation. Cold trapping in the cryo preparation chamber and SEM chamber ensures the whole process is frost free. Specimen process times are typically between five and ten minutes. Aurion UltraSmall ImmunoGold Reagents and Conventional ImmunoGold Reagents - Order any of our Ultrasmall Reagents and receive a $25 gift certificate good towards the purchase of any of our EMS line of products. Reduction of the gold particle size provides Ultra Small Immunogold Reagents with fundamentally different characteristics when compared with conjugates built around larger particles. While the Conventional Immunogold Reagents can be thought of as particles coated with proteins, Ultra Small Immunogold Reagents are proteins coated with one or more gold particles. With this structure, both the overall size of the conjugates, as well as steric hindrance are decreased. Innovative and Versatile Sputter Coaters and Carbon Evaporator- For all Electron Microscopy Applications: SEM, high resolution FESEM and TEM - Buy a new unit today and get a $500 credit towards the purchase of any accessories we offer. The EMS 150R Plus, the EMS 150T Plus and the EMS 300 Plus Series offer a complete range of stand alone carbon coaters, sputter coaters, Sputter/Carbon coaters in one. We offer low-cost, rotary-pumped systems for depositing non-oxidizing metals - such as gold (Au) and platinum (Pt) - and also turbomolecular-pumped models, suitable for oxidizing and non-oxidizing metals - such as chromium (Cr). Large chamber models are available for specimens up to 8"/200mm diameter, and all sputter coaters can be fitted with carbon evaporation attachments. C-flat™ is the premier holey carbon grid for cryo-transmission electron microscopy. C-flat™ is an ultra-flat, holey carbon-coated TEM support grid for transmission electron microscopy (TEM). Unlike competing holey carbon films, C-flat™ is manufactured without plastics, so it is clean upon arrival and the user has no residue to contend with. NIGHTSEA™ Stereo Microscope Fluorescence Adapter - Adapt your existing lab stereo microscopes for fluorescence - Buy a NIGHTSEA™ SFA and receive a $50 gift certificate for any of our consumables and supplies. Exchange any old diamond knife from any manufacturer for a brand new Ultra diamond knife and pay almost half the price of a new knife. No matter what size you trade in, you may choose any size DiATOME Ultra knife at the reduced price. Resharpen 2 knives, get a third knife resharpened for free. Exchange any old diamond knife from any manufacturer for a brand new Histo diamond knife (Regular or Jumbo) and pay a discounted price for a new knife. No matter what size you trade in, you may choose any size Diatome Histo knife. 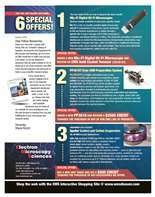 This program allows you to purchase any new DiATOME Diamond Knife at its regular price and receive a $250.00 coupon towards the purchase of chemicals, accessories and supplies from Electron Microscopy Sciences. If you would like to receive Catalog XVII or any of our separate brochures on any of our equipment mentioned above, please call, write, e-mail, fax us, or complete our catalog request form. Please note that our entire catalog and separate brochures may be found at in the online catalog. We look forward to hearing from you and fulfilling all of your microscopy and research needs.